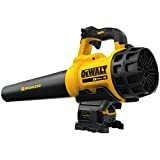 What is the Best Battery Leaf Blower of 2019? The DEWALT DCBL720P1 20V Lithium-Ion XR Brushless Blower is the best battery leaf blower based on the value it provides. It’s a wonderful feeling to have a garden full of trees. But that also means you need to keep it clean. The season of fall will bring a lot of leaves in your garden. You can use a garden rake to collect the leaves. But if your garden is large, it can be quite some work. A leaf blower can help you get the job done with ease and efficiency. Let’s look at the best battery leaf blower you can buy that can help you with this. What is a battery leaf blower? What are the different types of leaf blower? Do you need a battery leaf blower? A leaf blower is a machine you can use to collect dried and wet leaves as well as other debris in your garden. It consists of a motor that blows air out of a tube that will move the leaves and debris. A battery powered leaf blower comes with a cordless rechargeable battery. This gives you mobility. Such a leaf blower is simple to use and maintain. And it does not pollute the environment. There are different types of leaf blowers available based on your needs. They could be a backpack leaf blower where you carry the motor on your back. This helps you get a powerful leaf blower. And the weight is well-distributed on your body. A handheld leaf blower is one you hold in your hands. They tend to be lightweight and ergonomic. But have less power compared to commercial ones. A walk behind leaf blower is a powerful one you can push around in your yard. They tend to be heavy and harder to use. The leaf blower can be electric or gas-powered. The electric ones could be corded or cordless. A corded leaf blower has a cord you need to plug into a power socket to get the motor running. It’s limited by the outdoor extension cord you use. It’s inexpensive and lightweight compared to the other types of leaf blowers. The cordless or battery-powered leaf blower uses a Lithium-Ion rechargeable battery as power. This gives you better mobility than a corded one. But they tend to be expensive and heavier. The gas-powered leaf blower is one that gives the best power. If you want a commercial one this should be your choice. But it’s heavy, expensive, and difficult to maintain. The gas-powered leaf blower causes more noise and emissions compared to an electric one. If you have a small garden with a few trees, you can make use of a garden rake to collect the leaves. But if you have a big garden, it’s going to be time-consuming and hard work. That’s where it’s better to use a leaf blower. A battery-powered leaf blower can give you good mobility in the yard. It’s easy to use, decent weight, and easy to maintain. And it’s not noisy or releasing emissions like a gas-powered one. It’s smart to choose the best battery-powered leaf blower for your money. There are certain factors that can help make this decision. A cordless leaf blower is not the most expensive equipment you’ll buy. But it’s not the cheapest either. You want to ensure your money is well spent and you get a durable machine. One that will last you several years with minimal maintenance. The power of a cordless leaf blower is measured in the Volts. You want one that is powerful enough to blow dried leaves, wet leaves, twigs, and debris. The higher the power the better will the performance be. But that also increases the cost of the cordless leaf blower. The performance of the battery is crucial when using the leaf blower for a long time. You don’t want one that drains out fast and needs a lot of time to recharge. It’s nice to get a powerful battery that has fast charging. And gives you a long enough blower time. If you have a lot of leaves collecting in your garden, you’ll need a good speed from your blower. The speed is determined by the CFM (Cubic Feet per Minute) of air volume that blows from the tube. Or the RPM (Revolutions per minute) of the motor. And the MPH (miles per hour) airspeed of the blower. The handheld battery-powered leaf blowers tend to be lighter by design. But you should try some of them out to know which one is suitable for you. The lighter the cordless leaf blower, the longer you’ll be able to carry it without fatigue. You should know that the larger the battery, the more the weight of the blower. The cordless leaf blower is used by one or two hands. You want to make sure the handle is ergonomic and easy to carry for a long time. The control should be easy to use without twisting your wrist. It’s nice to have cruise control that can keep a constant speed without you having to keep a button pressed all the time. A cordless leaf blower does not have the problem of being noisy like a gas-powered one. But it’s nice to know the noise levels of the one you choose. Select one that gives you good performance without being a nuisance for you and your neighbors. A battery leaf blower is not as expensive as a gas-powered one. But it’s usually more than a corded one. Choose the cordless leaf blower on the quality and use rather than the price. This ensures you get a high-quality, durable tool that lasts you a long time. If you’re doing occasional work in the garden, it’s OK to go for a budget version. Just know what you’re getting and how long it could possibly last. It’s nice to be able to use the cordless leaf blower without worrying about break down. That’s why a long warranty can give you peace of mind when using the leaf blower. Some leaf blowers come with a limited one-year warranty while others can extend up to five years. There could be a different warranty on the tool and on the battery. It’s good to read the user manual before trying to use the battery leaf blower. It’ll contain instructions on setting it up, starting, and maintaining the leaf blower. Ensure that the battery is fully charged before using the cordless leaf blower. This will help you get long performance while using the leaf blower. Don’t use the leaf blower against the wind. This will reduce its efficiency and blow debris towards you. Use the leaf blower with the wind against your back for good performance. Use safety gear when using the battery leaf blower. A pair of safety goggles protects your eyes from flying debris. Use long sleeves shirt and long pants that protect your hands and feet from debris. If your leaf blower is noisy, you’ll need to use earplugs to protect your ears from damage. Talk to your neighbors for the right time of using the leaf blower. You don’t want to disturb them. Make sure the work area is clear of children and pets before you use the battery leaf blower. Before using the leaf blower, clear the area from any heavy debris like branches and rocks. Move heavy objects like tables and chairs out of the way to make it easier. Use the leaf blower in a semi-circular pattern so you’re moving the leaves and debris to a single point. This will make it easier to collect the materials and dispose of them. You should use the leaf blower in bursts to move the leaves. A few leaves at a time till you collect them in a pile. You don’t want to try to move the pile using the blower. Pick the pile up with a rake or your hands and put them in a bin for compost or disposal. Don’t blow the leaves towards a wall as they’ll end up scattered and on your body. Move the leaves along the wall and to the point where you’re collecting them. Once you’re done collecting the leaves, turn the leaf blower off and set it down. Make sure that none of the parts are covered with debris. If they are, clean them up with a damp cloth. Check the parts for any damage. If there is, you’ll need to get those parts or the leaf blower replaced. When done with the leaf blower, store it at a safe height. It should be out of the reach of children and pets. The DEWALT DCBL720P1 is a cordless leaf blower that comes with a 20V Lithium-Ion battery. This gives you good power for blowing leaves and debris from your garden. The motor is brushless which means you get good durability and efficiency when using this leaf blower. The innovative axial fan design makes it give an air output of 400 CFM and 90 MPH. The variable trigger will help you control the speed of this leaf blower based on your needs. The design of this leaf blower is ergonomic so you can use it for a long time without fatigue on your arms. It weighs 7.1 lbs which makes it lightweight and comfortable to hold. The DEWALT DcbL720P1 has an easy start mechanism so you won’t have problems turning it on. This leaf blower comes with a limited three-year warranty that is good in case something does wrong when using it. The battery can drain out fast so you may need to use an additional one for longer jobs in the garden. The EGO Power+ comes with a turbine fan that delivers up to 480 CFM which is quite powerful. This should help you blow away dried and wet leaves with ease. The battery is 56V Lithium-Ion which means you get plenty of work time on a single charge. The motor is brushless which means you get good durability and performance. There’s a 3-speed control to change based on your needs and a turbo boost as well. The weather-resistant construction means you can use this leaf blower in all types of weather without worrying. The EGO Power+ generates a very low noise of up to 65 dB(A). This leaf blower weighs just 5.2 lbs which makes it very lightweight. You can use it for a long time without feeling fatigue. It’s a little expensive and does not come with a locking mechanism once it’s turned on. It comes with a limited five-year warranty on the tool which is the most you can get on a leaf blower in our list. 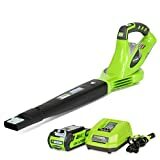 The Greenworks 25252 is a cordless leaf blower that has a 40V Lithium-Ion battery. It’s good for using in a small garden for gathering leaves and debris. The speed can be varied depending on how you are using it. You get 6 speed selections with it. And it can attain a speed up to 150 MPH and 135 CFM. The extension tube can help you get better reach for blowing the leaves. It improves the efficiency of the blower. The lightweight design makes it easy to use for a long time in the garden. The Greenworks 25252 weights just 3.3 lbs which makes it ultra lightweight. It’s easy to start and makes very low noise for you and your neighbors. This leaf blower comes with a limited four-year warranty which is good against manufacturing defects. This leaf blower is suitable for small jobs but don’t expect it to give you as good power as a commercial gas-powered one. The Black+Decker LSW221 is a cordless leaf blower that comes with a 20V Lithium-Ion battery. It’s can generate an air speed up to 130 MPH which is suitable for small tasks in your garden. This leaf blower is lightweight with a compact design. It weighs just 3.7 lbs which makes it easy to carry around for a long work session. It creates low noise so you don’t have issues of disturbing your neighbors. 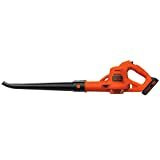 The Black+Decker LSW221 is an inexpensive leaf blower. If you’re looking for a budget leaf blower this could be a good choice. This leaf blower comes with a limited two-year warranty. So you can use it without worries about problems. The battery does take a little time to charge. And this blower is not suitable for heavy-duty work. 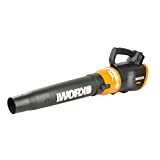 The Worx WG546 is a cordless leaf blower that has a 20V battery. This is good for small tasks in the garden. The turbine fan that comes with this leaf blower can give air volume capacity of up to 340 CFM. The air speed can reach up to 90 MPH. It comes with a two-speed setting based on your needs. It could be useful to get some more speed settings though. The time it takes to charge the full battery is about five hours. The Worx WG546 weighs about 6 lbs which makes it lightweight to use with one hand for a long time. The Hyper-stream air nozzle will help you get rid of debris and leaves that are stuck to your yard. This leaf blower comes with a limited three-year warranty which is good to have. You don’t need to worry about damage when using the blower. The DEWALT DCBL720P1 20V Lithium-Ion XR Brushless Blower is the best battery leaf blower you can get for the collecting of leaves and debris. You get a good performance from the brushless motor that also makes it durable. The air flow volume you can get is up to 400 CFM. It’s nice to be able to control the speed of the leaf blower based on your needs. The leaf blower is lightweight and easy to use for a long time in your garden without fatigue.